Welcome to your new home on campus! We are excited that you will be living with us. To help make your transition to college life as smooth as possible, move-in information will be posted here throughout the summer. Don’t forget to check your UMail account frequently so you don’t miss important emails. Follow us on social media for even more updates, move in tips, and prize giveaways! Move-in Day for Fall 2019 is August 15th: You have been issued an assigned arrival time. This will help everyone have a quality move-in experience and decrease traffic issues. We appreciate your help in following your arrival time. Check-in details: Please bring your uID or a photo ID to check-in. When you arrive, follow signs to your Housing Area check-in tent. At check-in, you will receive your room key as well as a move-in guide. Move-in early: Only students participating in a University of Utah sponsored event or program are eligible to check into the halls early. You will be required to notify HRE if you require an early move in date. If you are interested in signing up for UCrew, check back soon for more information on how to sign up. Late check-in: If you need to check-in later than your assigned move-in date, you are required to notify HRE prior to the deadline (will be shared here soon). You can pick up your key and move-in guide at the front desk of the Peterson Heritage Center, Marriott Honors Community, or Lassonde Studios. Room Key: You will be issued your room key at check-in. It is vital that you lock your doors at all times. The doors from the hallway automatically lock, so please take your key with you when you leave. It is also important that you talk with your roommates and suitemates about locking their door. Your meal plan will begin with breakfast on Thursday, August 15. In addition, you are invited to a free, special opening tailgate at the PHC on Thursday, August 15 from 5 p.m. to 8 p.m. — friends and family are welcome! Changing Your Meal Plan: You may change your meal plan once during the first week of the semester. Changes must be made by Friday, August 24 at 5 p.m. MDT. You may change your meal plan by visiting the HRE website beginning on move-in day. Looking for something to do? There are a ton of fun HRE and University events that are being planned just for you! Events for HRE residents are listed below; a list of University events may be found here. Thursday, August 15 – Move In! 5:00-8:00 p.m Kick-Off Tailgate: You and your family are the guests of honor. Swing by the Peterson Heritage Center Dining Room or dig into summer favorites outside on the grill, courtesy of Dining Services. Times To Be Announced. Community Meetings (Mandatory): Specific times and locations will be posted within your communities and attendance will be taken. Led by your Resident Advisor, you’ll connect with your neighbors, learn policies, and set sail towards thriving. Time To Be Announced. Movie Screening: Join us at dusk for an Outdoor Film Screening. Shuttles will be provided. Popcorn and refreshments provided. Hosted by the Residence Hall Association. Your UCard is your student ID, but also serves as a variety of other important functions! You will use your UCard to access your building, use your meal swipes or Flex Dollars, and to tap on to UTA public transit. 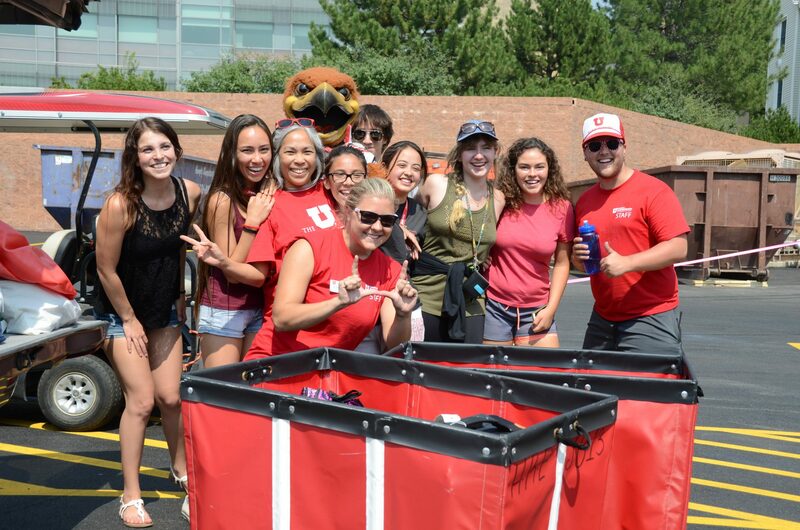 You should have received your UCard when you attended orientation… don’t forget to bring it on Move in Day! For more information, please visit the UCard webiste. If you haven’t attended orientation yet, you will receive a temporary access card. If you requested a mailbox, you will receive an email to your UMail with your mailbox number and personal mailing address. You can begin receiving mail 7 days prior to your move-in date. However, as much as possible, please arrange for the package to be delivered on the day you arrive. Before shipping large items to campus, please consult with your roommate/suitemate and determine that items will fit in your room. Charges for the fall semester will be available in your Housing U account in August 2018. The first payment must be received by August 16, 2018 (the first day of move-in). You will see your room and meal plan charges for each month, as well as RHA dues and any optional services you selected. Only those items dated in August are due before/upon your arrival. You may pay your bill online in Housing U using a credit card, calling in a credit/debit card payment to HRE at 801-587-2002, or in person at the HRE office. You may contact the HRE office to set up a recurring payment as well. Visit our Rates & Housing Account Page for more details on paying for your housing. If you are locked out of your room, please go to the PHC, MHC, or Lassonde front desk to sign out a lock-out key. You can check out a loaner key for free for 30 minutes. If you need a loaner key longer than 30 minutes you can check out a loaner key for up to seven days for $10. If you still can’t find your key, we will change your locks ($60) so your room is secure. If you are locked out of your building you can borrow a temporary access card from the PHC, MHC, or Lassonde front desk. You can check out a temporary access card for free for 30 minutes. If you need to keep the card for longer than 30 minutes, you can check one out up to seven days for $ 10.00 fee. Staff will always verify your identity when letting you into your room or issuing a lock out key. Billing for all fees will be to your Housing U account. If you have financial aid that will cover all or part of your housing fees, you may bring your financial aid check to the HRE office when you receive it, work with one of our accounting specialists to allow them to automatically transfer the funds for you, or select this option when you complete your reservation in Housing U. If you have a university scholarship that covers your housing, these should be posted to your account by August 31. Please note, that there are occasions in which we are awaiting information from certain departments and are unable to post by the aforementioned date. We will, however, post the scholarships as soon as we have the information needed. If you do not have your financial aid sent directly to HRE after receiving the financial aid/scholarship reimbursement check and paying your tuition, please bring the excess funds to HRE to pay your bill. If you have questions regarding your scholarship, please contact the Accounting Office at 801-587-2002 or scholarships@housing.utah.edu. If your plans have changed and you will not be attending the University of Utah or no longer plan to live on campus, please contact HRE to cancel your room reservation. Additional information about terminating your contract may be found here. HRE will be extending our hours of operation for the month of August as we approach Move In. Please feel free to come by, give us a call, or send us an email if you have any questions. For the most up-to-date hours for dining in your area, please visit Dining Services.